I don’t know why I forget this stuff, but I am remembering how much work making a mold is… Yeah. It is one of those things that I remember when I really think about it, but when I haven’t done it for a while I convince myself that it will just take a few hours. 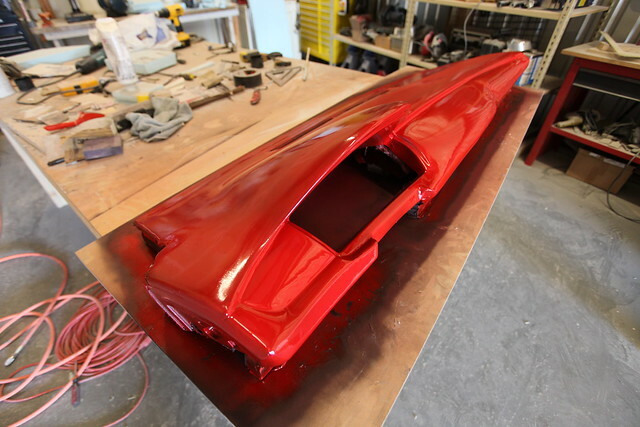 If you haven’t seen part one of this build check it out here. This time I have been going layer after layer, working my way up and trying to get a nice smooth final product. There have been some tricky parts like the airbag area and the vent holes. In addition the portion that I have made with foam is a bit tricky as well, occasionally when you get beyond the bondo layer you find out what happened very quickly when you hit the soft foam! I reached a point where I needed a much better visual indicator of what was going on. 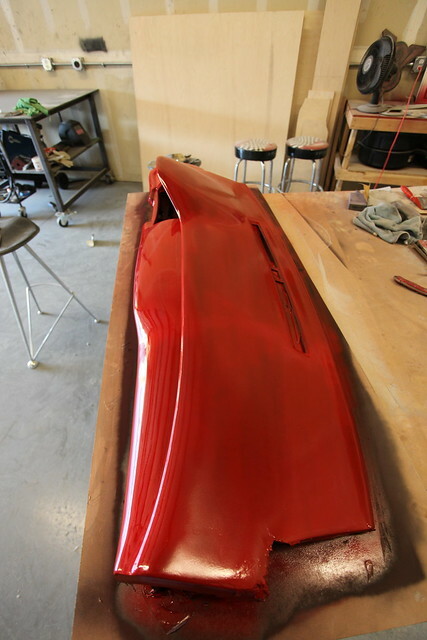 So I had to put a coat of glossy paint on in order to see the lines better than I could with the flat primer. So I chose a red paint and painted it up. It gave away some issues immediately. There were some sanding marks that were a bit deeper than anticipated, some waves that I needed to sort out and basically it just did exactly what it needed to do. So I did a full wet sand on the part and really smoothed it out. 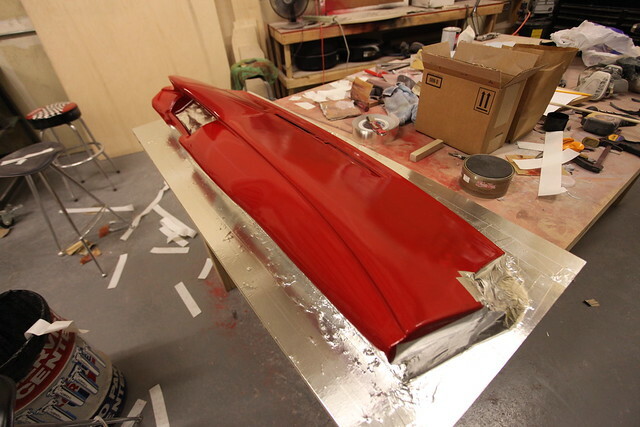 some spots got all the way back to bondo again through the paint layer and the primer layer. 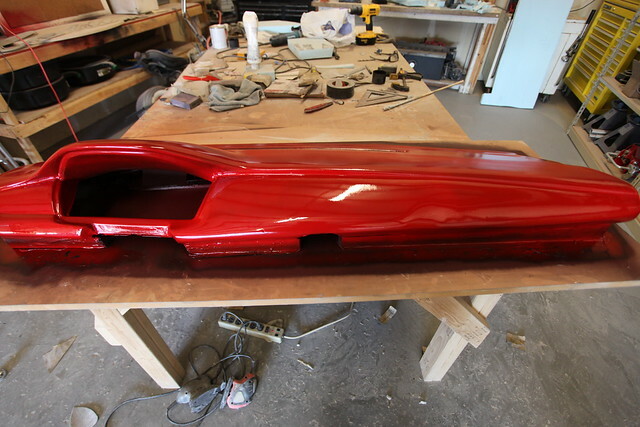 Once I got it all smoothed out another layer of glossy red and WOW! what a difference! It looks very good right now. There are a few little imperfections, they are all pits and will actually be easier to fix in the mold itself so I am going to leave them and sand them out of the final mold. After the mold was fully prepped we took aluminum tape to create the rest of the part. Basically the part needs draft, so using the tape is much faster and easier to shape for portions of the mold that we don’t care about. 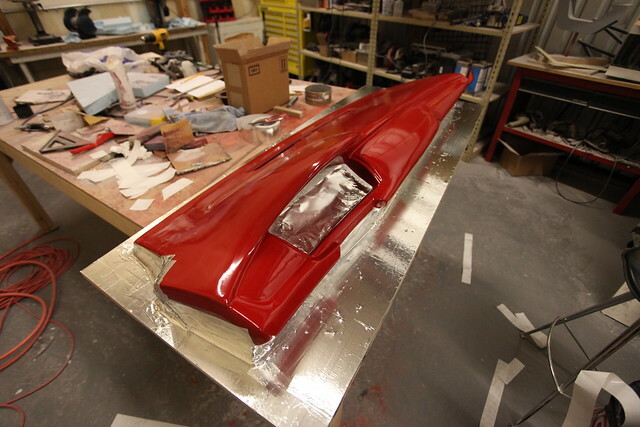 Plus it doesn’t really stick to the fiberglass, so that helps as well. 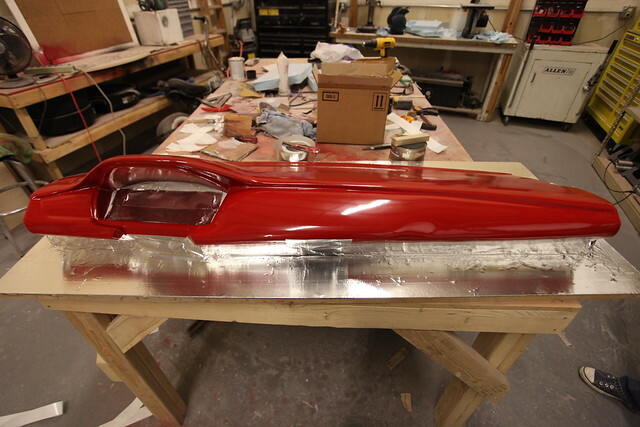 I believe that there will be two more parts to this project, one more for the mold making and one more part for the final part that we pull off the mold. Check back soon!